Ridgefield Library presents: "Saving Animals from Extinction: Tales of Species Recovery in Connecticut and Beyond" with Jim Knox on Wednesday, December 13 beginning at 7 PM. Register here. 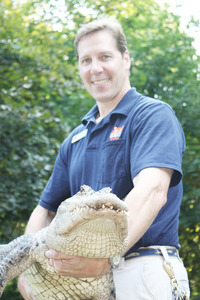 Join Zoologist and Connecticut's Beardsley Zoo's Curator of Education, Jim Knox as he profiles his work with Species Survival Plans and wild species re-introductions in Connecticut and beyond. Learn how 21st-century science is extending the reach and achievements of field conservationists and how Fairfield County citizens can become involved in recovery efforts to protect our planet's most imperiled and majestic creatures. As the writer and host for PBS television's WildZoofari, Jim Knox has shared his knowledge of, and passion for wildlife with millions of viewers throughout the U.S., Russia, Thailand, the Middle East and Europe on Animal Planet. Jim has served as an on-camera wildlife expert for The Today Show, The CBS Early Show and Fox News. Jim Knox also lectures at the University of Connecticut, serves as an Advisory Board Member for the Biology Department at Post University, and as a board member with The Science Education Center of Greenwich.